In food processor, place yogurt, oil, dill, lemon juice, salt, pepper and garlic. Cover; process 30 seconds or until garlic is chopped and mixture is thoroughly blended. Transfer to bowl. Cover; refrigerate at least 1 hour but no longer than 24 hours. 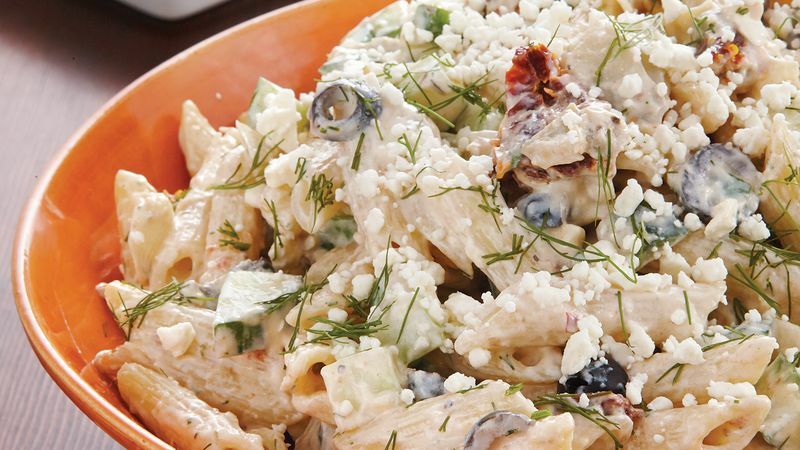 In large bowl, stir together cooked pasta, olives, cucumbers, tomatoes and artichoke hearts until well blended. Add yogurt mixture; stir just until well coated. Gently stir in cheese. Cover; refrigerate 1 hour. Garnish with additional dill.